Scott Joplin was famous for his Maple Leaf Rag and others but could write music in other styles. His tendency toward classical sounds and forms culminated in his full-length opera, Treemonisha. Evidence shows that Joplin was also absorbing elements of the blues style, although he never actually wrote a blues. In Pineapple Rag, published in 1908, a significant development is Joplin’s use of a flattened “blue” seventh in the C section, which shows the beginnings of the influence of folk blues on popular music during that time. The C section of his final rag from 1914, Magnetic Rag, uses a modified blues progression. Magnetic Rag also concludes with the well-known “Barbershop” ending that was becoming customary in blues at that time. Some have also pointed to the Pineapple Rag as one of the first examples of a walking bass, later used as part of the boogie woogie style. The D section does not have broken octaves like a typical walking bass, but it does have a rising and falling bass line similar to those later found in boogie woogie music. Ragtime pianist John Arpin’s recording of Pineapple Rag utilizes this sort of walking bass figure. While there is no evidence that Scott Joplin performed Pineapple Rag this way, it is at least conceivable because of his piano roll recording of Magnetic Rag made in 1916. If we compare the published score of Magnetic Rag with a transcription of the piano roll, we can see how Joplin used a walking bass figure to embellish the original score. 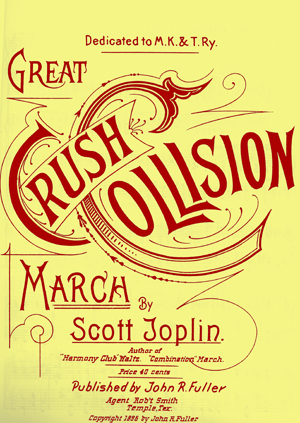 Another piece of interest to the development of blues piano styles is The Crush Collision March, Scott Joplin’s first piano solo, published in 1896. This was several years before Joplin published his first rag. While Joplin had yet to find his “voice” via the style of ragtime this early attempt at writing still shows his emerging inventiveness. 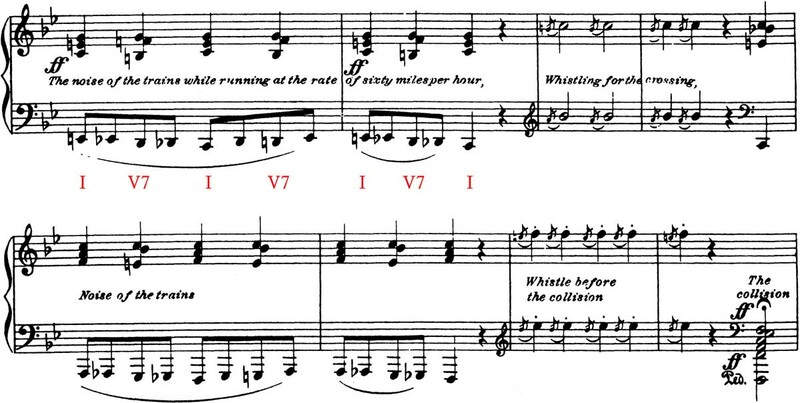 The Crush Collision March is one of the earliest attempts to imitate train noises on the piano, at least in published form. The imitation of trains is an important element, not in ragtime but in blues styles like barrelhouse and boogie woogie. The steam train played a significant role in the lives of the itinerant pianists who would catch the trains to travel in order to find their next playing job. However, Scott Joplin’s interest in depicting train noises came from a singular event, a staged train crash at the town of Crush, Texas, in 1896. Two trains were sent racing towards each other on the same track at high speed, unmanned of course, resulting in a spectacular crash. Designed as a spectacle to promote the railroad, this event was advertised ahead of time and drew a great crowd of people, apparently the young Scott Joplin among them. In The Crush Collision March the trains are depicted by a chromatic figure in the left hand combined with alternating tonic and dominant 7th chords in the right hand. The figure in the right hand is significant because it showed up later in Meade ‘Lux’ Lewis’s Honky Tonk Train Blues, one of the earliest and most famous boogie woogie pieces. Just like The Crush Collision March, the harmony alternates every beat between tonic and dominant 7th chords, except it has been transferred to the left hand. Another musical depiction in The Crush Collision March is of the train whistles. This is accomplished by dual grace note figures at the interval of a major 2nd. This type of figure would occur in many later pieces, including Honky Tonk Train Blues. A recording of Scott Joplin’s self-made piano rolls of Maple Leaf Rag, Magnetic Rag, and W. C. Handy’s Ole Miss Rag can be found in Scott Joplin, Elite Syncopations, Classic Ragtime From Rare Piano Rolls. Another recording with Joplin’s personal rolls of Maple Leaf Rag, Something Doing, and Weeping Willow is “The Entertainer”: Classic Ragtime from Rare Piano Rolls.